This is the same interview that appear at Malaysia Personal Finance(malaysiapersonalfinance.blogspot.com). I hope you enjoy the unedited interview! 1) Tell us a bit about your childhood and how it affects your today’s practice on personal finance ? 2) Answer this question without checking or asking for references : If you can remember, what is your Zodiac and Astrology signs ? 3) What are the things you like to do during your free time, ie. your hobbies ? And what do you most dislike about ? 4) What is your favorite colors and numbers ? Any most dislikes ? 5) What is your favorite food ? What do you hate most ? 6) If you can meet a person dead or alive, who would that be ? What would you ask him ? Abraham Lincoln. What’s your secret of not giving up and to be a great person? 7) What is the best and worst feeling you have ever had ? Best feeling-Seeing my CPA Book at MPH Book stores and library. All these while I’ve been buying so many books until have a mini library at home, now others can read and learn what I shared. 8) What is the last thing you do before go to sleep ? 9) What is the first thing you do when you wake up ? 10) If you were to build a personal finance portfolio for a young man who has similar life path as yours, what will it be ? First invest in yourself by reading books, attending seminar & networking. Seek out for a mentor or role model. Ask help if need to. Always remember that what works for others may not suit you. Even there’s a saying “One man’s meat is another man’s poison.”. Therefore you must be able to adapt it in order to apply what you have learned. 11) You met someone in a social party, describe what you do in 2 to 3 sentences. 12) If you are not doing what you are doing now, what would you be doing ? 13) How much time do you spend on your personal finance blog ? 14) What is the main objective of your blog, is it initially profit oriented and who are your targeted blog readers ? I like to learn about Investing, Making money and personal finance. In another words it’s my passion as well. Every time when I visit a book stores, the first section to be visited is on Finance/Investment. The main objective of my blog is to share about what I have learned, share and educate other about importance of personal finance. All this thing is sadly not taught at school even it’s very important in life. 15) What is the biggest achievement your blog so far ? 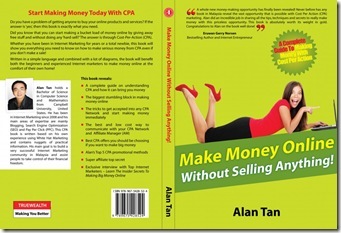 I’m the first Malaysian best selling author that wrote a WordPress blogging book that teaches people how to blog and make money online in Malaysia. This book expected to hit the bookstores early 2012 . Instead of just making friends on Facebook or watching videos on YouTube, wouldn’t it be better to spend that time generating online income for yourself, your love ones and your family? 16) Tell us one URL other than your own that your readers should read about ? 17) How many more years do you think your blog will exist for and how do you plan to finance your blog forever if planned to at all ? As long as my passion don’t die off. 18) The world is big, many people have different point of views and emotions. If you met someone who called you geek, liar, cheaters because you yourself didn’t do what you preach, how would you handle them ? We can’t control what other want to say. I don’t think can do much. 19) What do you think about these interview questions and how this interview session can be improved ? 20) Would you be interested to meet other finance bloggers in person ? This entry was posted on Monday, January 16th, 2012 at 3:35 am	and is filed under General. You can follow any responses to this entry through the RSS 2.0 feed. Both comments and pings are currently closed.